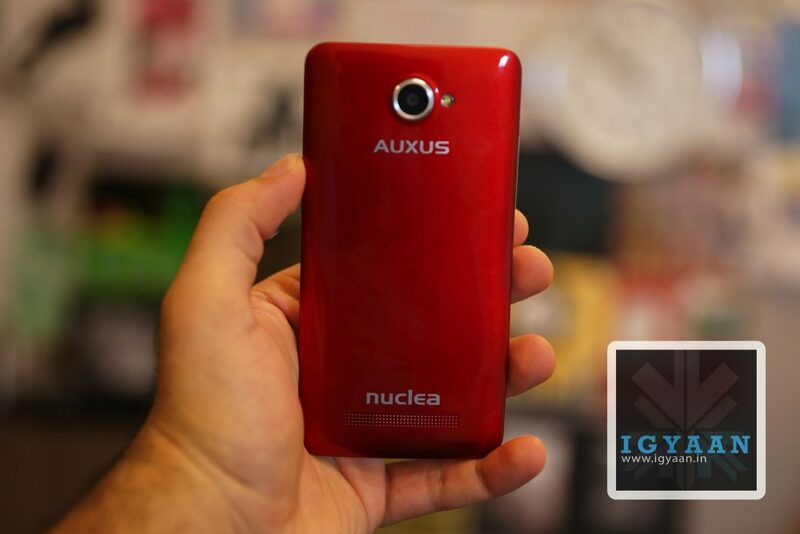 The iBerry Auxus Nuclea N1 was announced recently and promised a lot of fanfare, the device brings a lot more to the table than is expected from devices this value, but does it stand a chance? 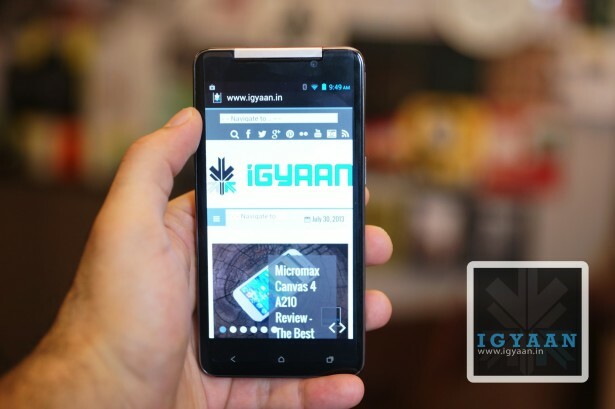 Lets Find Out in our Review of the iBerry Auxus Nuclea N1. The iBerry Auxus Nuclea N1 resembles the HTC Butterfly, a mix of the first butterfly in looks and a paint job that resembles the newer HTC Butterfly. The device itself has been assembled out of plastic but feels quite robust. The front sports gorilla glass which claims a 20% increase in toughness and breakage/scratch resistance. The right mix of hardware has made this device a lot more appreciable, thanks to a full HD display, a quad core chipset, 1 GB RAM, a set of 13 and 8 MP Cameras, 4 GB storage and 64 GB Expandability vis MicroSD cards (although our 64 GB class 10 Sandisk card refused to work).The battery on paper is also fairly sufficient with the 2800mAh badge. The front of the iBerry Auxus Nuclea N1 has a OGS display which is pitched at 1080p, the full HD resolution is gorgeous and is a pleasure to have on any device. What is also fascinating is the fact that the display nicely moulds out into the bezel that looks good and gives the device the upper edge in terms of looks. The display is only faintly visible outdoors and lacks the excessive brightness you would expect from a display with a 1080p resolution, but so do most of the higher end flagships. Viewing angles are great and you get a nice overall perspective when watching movies, browsing through pictures and other consumption models. Multimedia consumption on the device is great as well thanks to the overall mix of the hardware and software. The Display mixed up with a variety of Apps available from the Google Play store make this a jumble of multimedia. Internet is well experienced on the handset and display plays a major role in multimedia which seems to be fulfilled thanks to the high resolution. The RAM optimization on the iBerry Auxus Nuclea N1 is a major drawback on this handset, which really comes to create issues in Gaming. Any game around the like of Dead Trigger and Virtual Tennis will perform great on the handset, but playing games like Asphalt 7 and NOVA 3 will require constant reboots and RAM Optimizing software. Watch our experience below. 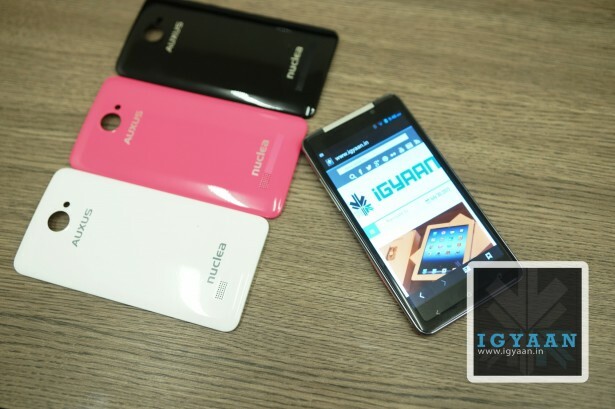 The Cameras on the iBerry Auxus Nuclea N1 are nothing but hype, the 13 MP snapper is average when it comes to image production, the BSI sensor helps but images are not composed correctly, with a lot of color fringing and imbalance in the light input, the sensor only seems mediocre in front of Samsung S4’s 13 MP. The front 8 MP shooter is just for numbers and does not even justify the moniker, watch some samples in the video review. The iBerry Auxus Nuclea N1, did fairly well in phone call tests, we did face a few dropped calls while traveling, but it is safe to say they could be cell switch drops and not necessarily hardware related. The touch screen is very responsive and the multitouch input ensures that your messaging will not be hindered while using the device, especially for typing weather you go for it in portrait or landscape. Android 4.2 Jelly Bean as an OS is a good thing to have, especially since it is fairly recent, but the lack of optimization of Software and Hardware is the biggest flaw of this handset, in day to day use you may not feel the impact, but the minute your RAM usage gets exceeded the phone becomes a big drama queen, and throws tantrums until you pull down the covers and give the battery a quick swap. Constant reboot is the only solution to optimizing this otherwise great handset. The company claims to be working on a fix, but the fact that the phone has reached the market with such a major flaw speaks a lot about the lack of testing, especially since the company needed this handset to break into the market. Not that the phone is a complete failure, its a great handset , but truly lacks in performance, and no one but the engineers and testers at the outfit are to blame. Despite the frequent outbursts of RAM mismanagement and the dire need to reboot the handset you will be quite happy to know that the phone will manage 5 – 6 hours of talk time on an average day and the battery life should be good enough to take the beating from an average consumer for 24 hours. The software if updated with a fix for the battery issues will bring about a positive change in the battery life, which will only add to the already impressive value. Smartphones have become increasingly confusing nowadays, with endless choices and price brackets to choose from, one really needs to understand what he is getting into. While its always great to have a well built phone ( as the iBerry Auxus Nuclea N1 is ) with a mix of high end hardware ( just like the iBerry Auxus Nuclea N1 has) for a relatively low price ( which the iBerry Auxus Nuclea N1 is available at), it is also essential to ensure that the phone works, and works the way its supposed to. A future fix will fix anything, but at the present stage when the phone is available, with no real software fix in sight, the performance the heating up and RAM mismanagement, make us ask you to avoid this handset, till the time the company fixes the issue anyway. If that takes too long we have a whole array of handsets coming in from Samsung, Gionee, SOny and even Nokia that offer up a wonderful bundle of usage.